Were blind children the ‘preferred figures of disability in the Victorian imagination’ as Martha Holmes argues? 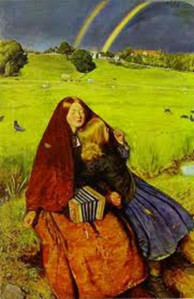 Depictions in art such as The Blind Girl by John Millais, 1856 (below) suggests that representations of blindness did generate widespread Victorian sentimentality and pity, which in turn led to the establishment of specialist institutions for blind children and adults. The Royal School for the Blind in Liverpool was the first institution of its kind in Britain when it was founded in 1791 by Edward Rushton. By the end of the nineteenth century there were over 50 such institutions, which educated, employed and relieved over 1,000 people.